3. Choose your Woocommerce product category to include in WooCommerce to Webgains product feed. 4. Give a name to the product feed file you create for Webgains merchant. 5. Click on ‘Get Feed’. 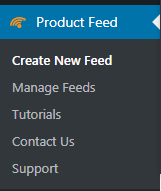 You can also view your recently created feeds from the Manage Feed tab. 7. When you think your feed meets all the required attribute you can submit to Webgains for review.